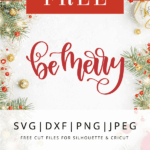 Use this craft file for all your creative Christmas craft projects. Make some beautiful things for your home, your closet, or as a gift for a dear friend! I love your designs. I am new to using a Cricut and your ideas and files are such a blessing. Thank you for sharing. new to cricut and came across you lovely design and great ideas. Thank you for sharing.